We had been seeing purple hues pop up in virtually every major brand redesign this year. Back in 2014, Pantone had already given us fuchsia/purple dreams selecting Radiant Orchid as Color of The Year. Still, nothing could have prepared us for Ultra Violet: a galactic, deep purple shade that is about to take the world of design by storm. 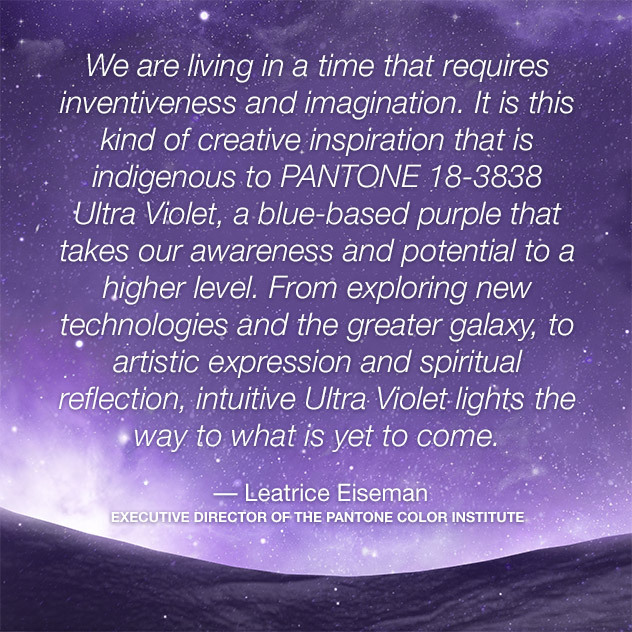 In words used by the Pantone team this morning, "Ultra Violet lights the way to what is yet to come." We've covered some of the emotions associated with different colors here before. Purple, in particular, is often linked to terms like soothing, exciting, and calm. In a study on fashion brand personality, purple logos were significantly associated with sophistication, including traits like "feminine", "glamorous", and "charming". As a color, purple is the result of combining red and blue in different proportions. Warmer purples (like lilac) contain more red and cooler purples (think periwinkle) contain more blue. Ultra Violet, the specific shade Pantone has chosen this year, is closer to blue, features a high chroma (intensity), and a low value (dark).